For your completed Mini-tourneys & Tournaments, you can now review your own backgammon matches visually game-by-game, move-by-move. You can only review your daily list of backgammon games if you are logged in. To review your Backgammon Ticket games in 'Manage Account', you can select 'mini/multi-player tournaments' or 'account statement', and then select 'view' for a specific game. 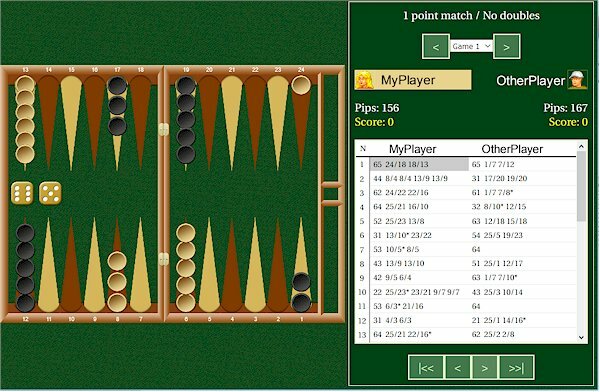 Below is a sample backgammon game as seen using a backgammon game viewer. On the right-hand side of the backgammon board there's a game navigation panel. You can navigate within each game of the match and move through each move within a game.